Officially licensed products (Warner brothers)designed and edited by BDK and Warner Brothers team. This seat cover will add unique and fun environment to your vehicle. Additionally the seat cover is built with premium poly and extra 5mm foam Cushion which provide maximum comfort. Good as a gift to all especially Warner Brothers character fans. Officially Licensed Products (Warner Brothers)Designed and Edited by BDK and Warner Brothers? team. 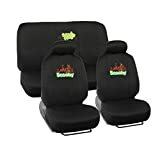 This seat cover will add unique and fun environment to your vehicle.Additionally the seat cover is built with premium poly and extra 5mm foam cushion which provide maximum comfort.Good as a gift to all! Especially Warner Brothers? character fans.